Today the Israeli government approved the nomination of Prof. Amir Yaron, a graduate of Tel Aviv University, for the post of governor of the Bank of Israel, the country’s central financial institution, which sets interest rates and monetary policy. 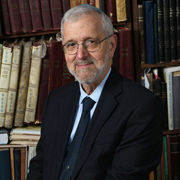 Prof. Yaron was born and raised in Israel and received his Bachelor’s and Master’s degrees in Economics from Tel Aviv University. He received his Ph.D. from the University of Chicago was until recently a professor of banking and finance at the Wharton School of the University of Pennsylvania. He academic specialty is in macro-finance, asset pricing and applied time series econometrics. Prof. Yaron is fifty-four years old and married, with two children. He will replace Dr. Karnit Flug, who has completed a five year term as the governor of the Bank of Israel.